The cell (plasma) membrane is a complex array of lipids and proteins that plays an essential role in the communication between the cell and its external environment (see image below). In complex multi-cellular organisms, individual tissue cells communicate with vast varieties of factors including hormones and cytokines that are found in the tissue fluids that bathe cells and within the circulatory system that delivers nutrients to these cells. 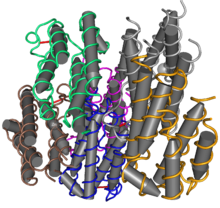 Cytokines are a special class of compounds including interferon (IFN) (see structure below) and interleukins. 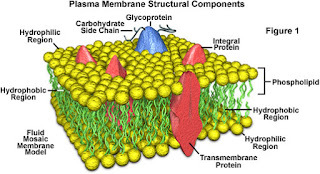 These substances are low molecular weight proteins often bound to sugar molecules (glycoproteins) that promote cell to cell communication within the immune system in response to inflammation, infectious agents and trauma. 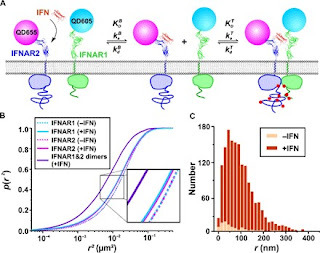 Changiiang You and his colleagues from *the Universitat Osnabruck, Germany, studied in detail the interaction dynamics of the complex array of signaling components and receptors on the plasma membrane especially in regard to IFN. Interferons augment the immune system response to viral infections and impede the growth of cancerous cells through the regulation of specific genes whose gene products impact cell growth. 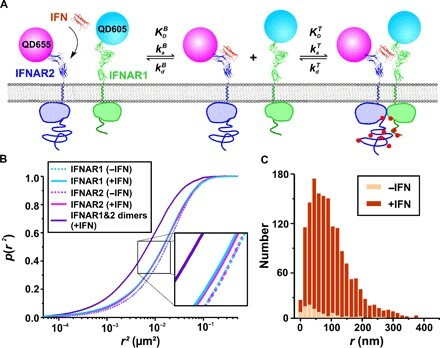 The results of their extensive investigation demonstrated that microcompartmentalization plays an essential role in facilitating binding of IFN to its specific receptor on the plasma membrane and the resulting cascade of signaling events that leads to gene expression (see image below). They found that the maintenance of the integrity of the membrane skeleton (MSK) is of crucial importance. These finding are of value; because, they help elucidate the complex interactions that are required to insure the successful role of key factors like interferon in proper cell function.